When abolitionist Sojourner Truth stated, "Ain't I a Woman," some regard that as the most definitive statement for affirming the pride and dignity that women have always possessed. From the womb of the Black woman has sprouted an entire civilization and the intrigue with which others hold her is testament to her queenly grace. Maya Angelou eloquently captures this in her famous poem "Phenomenal Woman." While the phenomenal Black woman has excelled in a variety of areas (including motherhood), warfare brings a deafening quietude. Since its inception thousands of years ago, chess remained a male domain. Its characteristics appeal to the combative nature of the male psyche, but of course, historic figures such as Queen Nzinga (Matamba) and Queen Hatshepsut (Kemet) have proven that women can make war! In American chess, Black women have been quiet in making a lasting presence in the board sport. This immortal question seems to be, "Where are the Black women in American chess?" That's a fair question. History is very sketchy in this regard since there are no formal archives which trace the activities of Black chess players over the past century… let alone female Black chess players. What can we say about Black female chess players today? They often burst onto the scene very quickly, reach their star and leave chess as quickly as they came. There have been discussions on why most girls (in general) do not stick with chess since in American chess, about half of the scholastic population is comprised of girls. What happens? In many cases, other aspirations take center stage and since chess is time-consuming (with poor prospects for financial return), it becomes yet another pleasant, but fading memory. In another regard, socioeconomic conditions force Black females to play a greater role in determining their future and thus, other affairs begin to take precedence… family, education, career, and of course, boys. 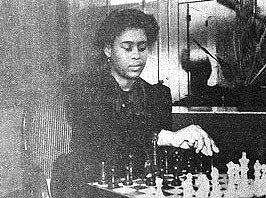 Perhaps the most famous Black female player was that of Baraka Shabazz, who was taught to play chess in a cabin in Alaska by her stepfather. Baraka, which means "blessed," burst onto the scene in the early 80s and became a media darling, particularly in the Black community. At age 15, Baraka would give simultaneous exhibitions of up to 20 boards, reached "Expert" level and later represented the U.S. in the under-16 girls' tournament in England. She played in several major tournaments before abruptly giving up the game in her late teens. Sources indicate that she simply collapsed under high expectations. Baraka spent some time in San Francisco, California and received instruction from IM Jeremy Silman. While Silman has memories of Baraka, he had no games of hers on record. He stated that Baraka played in the U.S. Women's Championship (in Utah). I remember meeting her at a tournament in Chicago and in those days, she favored the Colle System. While Baraka is the most famous, Collette McGruder of California was perhaps the first Black woman of note in American chess. She was the 1st to eclipse the 2000-level barrier and she told me at the 2001 National Open (Las Vegas) that she once won a major California tournament. McGruder has been on the Top Women's list for many, many years and still plays in tournaments, primarily on the American west coast. McGruder also knew Baraka on a personal level and perhaps was a bit of role model during Baraka's ascent. You Lost to a Girl!? Every male chess player has read about 12-year old Judit Polgar of Hungary and the teddy bear that she brought to the board. The Grandmasters would smile and say, "How cute!" What they did not realize (until right before being mated) was that Judit was an attacking genius and a prowling tiger at the board. Her miniature mates against her highly-fancied opponents are legendary. She, along with her two sisters (Zsuzsa and Sophia), have raised the standards of play for all females and is currently ranked 11th in the world at 2722 FIDE. Girls have always had the talent, but needed more encouragement and credible role models. One girl who possessed immense talent was a young Chicagoan named Bernadette Reddick who was taught by her father, Harold Reddick, Sr. Bernadette also had a talented younger brother named Harold Jr. I first saw Bernadette in the summer of 1981 at Harper Court, an outdoor venue where Chicago players gather. Everyone was crowding around her games. She took some losses, but beat up more than a few unsuspecting "park sharks." One older guy named "Benny" played 1.f3 and 2.Nh3 and 3.Nf2 against her and she made him play dearly for his foolish charade. Several players worked with sister-brother duo including myself, Roger Hickman, Robert Sanders, and on rare occasion, NM Marvin Dandridge. While "little Harold" had more raw talent (was ferocious at blitz), Bernadette was more disciplined and beat strong master Peter Pelts in classical tournament. At age 12, Bernadette had a rating around 1850 and was in the Top 50 list for women players. She also represented the U.S. in the World under-14 tournament in France. Harold was 11th on the under-12 chart and later peaked somewhere close to 1900. Both were pictured in the November 1982 issue of U.S. Chess Life (see above right). As Bernadette matured, she developed other interests, later got married, and began raising a family. There have been other girls on the America scene to make a presence. Kenyetta Lucas and Denise Pickard had been an integral part of the Philadelphia Vaux team which won a national title in 1997. Both were mentioned in the best-selling book, "I Choose to Stay." Jannelle Richardson of New York was considered a talent with her highest rating (to date) of 1639. The latest scholastic stars to have hit the scene have been Medina Parrilla of Bronx, New York and Stephanie Ballom of Mansfield, Texas. Both have recently been the subject of media attention and are gracing the Top 50 lists for girls. What will it take to inspire more girls to continue chess after their teen years? Perhaps it will take more role models figures not only in chess, but other sports (e.g., Venus and Serena Williams) to believe that they can achieve success where Blacks are under-represented at the highest levels. GM Maurice Ashley has done a lot for both boys and girls in this regard, but of course girls would like to see themselves in their role models. You know the time is coming when 12-year old Medina Parrilla says, "I want to be the first female African-American Grandmaster." It's time! Editor's Note: On 10 January 2004, NM Woody McClelland writes and states, "I would like to make sure that an African-American female player of the past gets her due as well -- Kimberly McClelland (my sister) who in 1993, as a 7th grader, won the reserve section of the National High School Chess Championship (in Dallas, Texas) -- becoming the first African-American woman to win a National Scholastic Chess Championship.